All 4 Pins in this Series the remaining 22 Pins, were Finally Released 8/13/2008 "Online" in the HRCPCC Pin Shop. Size: 2.25" x 1.50". Only 100 of each were made! Very difficult to find these now. You may never see some of these ever again! If you collect these pins please keep checking in with us to see what we have available. 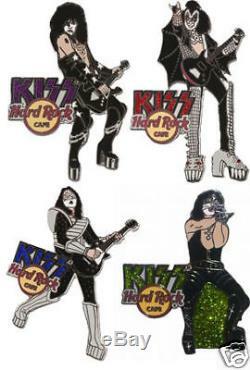 The item "KISS Hard Rock Cafe Pin Group DREAM LE 100 2006 Set" is in sale since Wednesday, January 14, 2009. This item is in the category "Entertainment Memorabilia\Music Memorabilia\Rock & Pop\Artists K\Kiss\Novelties". The seller is "kissarmywarehouse" and is located in Indianapolis, Indiana. This item can be shipped worldwide.